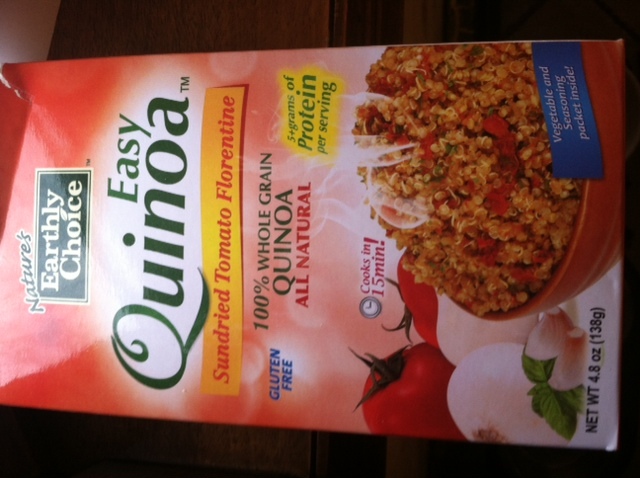 A new love of mine…Quinoa. 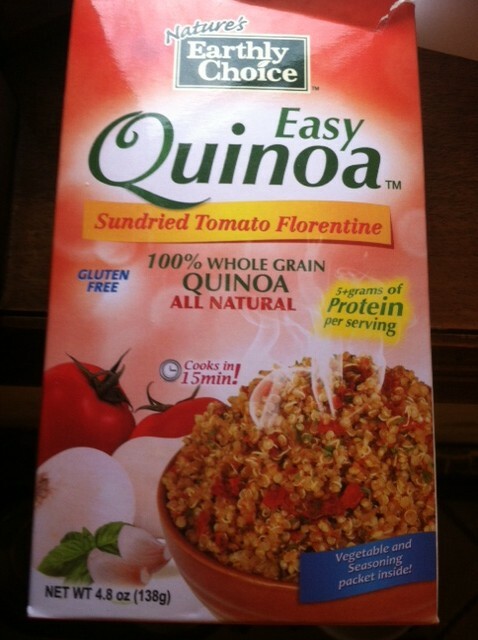 Definitely a new grain in my life, but since I am trying (read: failing but trying really hard) to eliminate the gluten in my diet…insert Quinoa! And quite perfect, no? 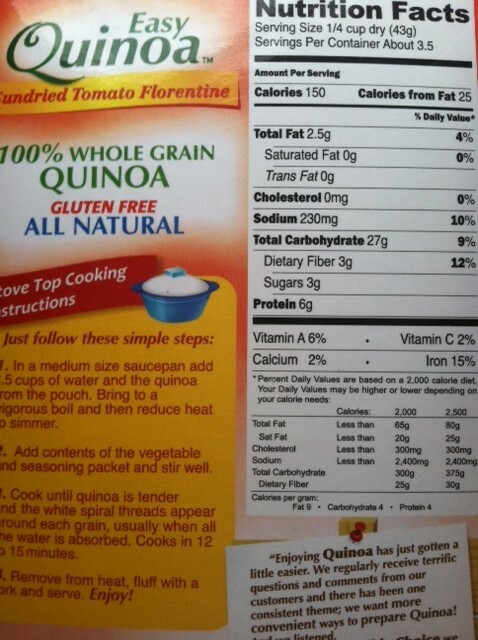 A good serving, a cup or so cooked, has quite a bit of fiber as well as protein. 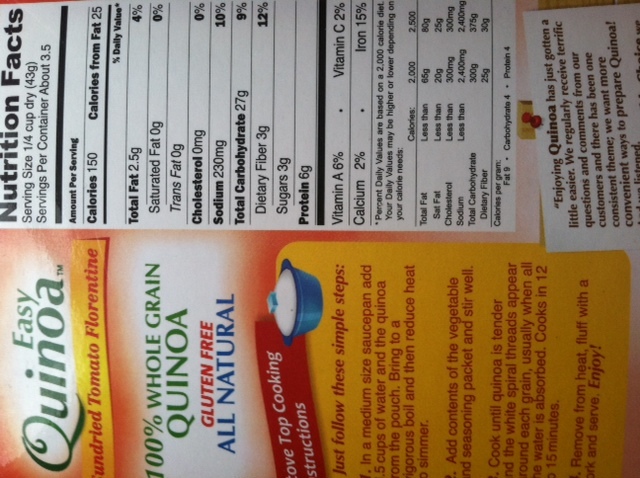 Plus it has a satisfying taste and texture, so it feels like I am actually eating something worthwhile. Anywho, I was sent this to try for free from the company. Followed the directions to a T and then spooned it into a bowl. Looks delish, eh? Easy to make? Uhhhhhh yes. 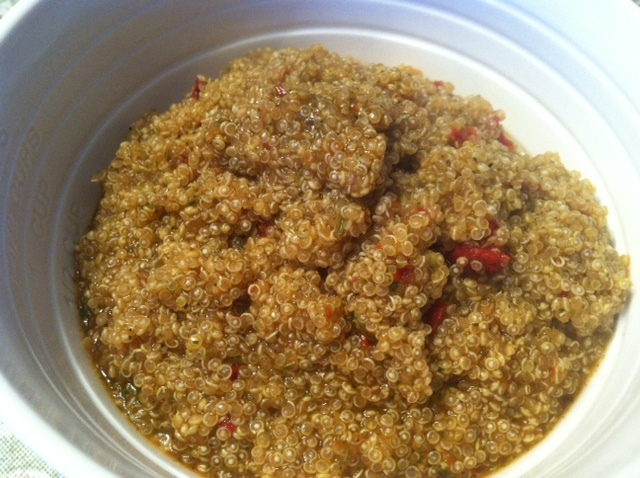 First time making quinoa and it came out just right (or at least I think??). Add water, let cook, add seasoning packet, etc. etc. Easy peasy. It was a tad chewy, but not super chewy, and I liked that it had a little bite to it. But… the Taste verdict? it was alright. It was VERY salty. Too salty actually. I wished that I only put half of the flavor packet in, instead of the whole thing. However, problem easily solved with the addition of some plain, steamed broccoli to absorb some of the flavor. Aside from being salty, it had garlic undertones and was quite potent. It did have a tad bit of an off flavor, which I contributed to the sundried tomato. I feel like sundried tomato is either a I-freaking-love-this thing or a gross-what-is-this kind of thing. I’m not sure which one I am yet…hah.